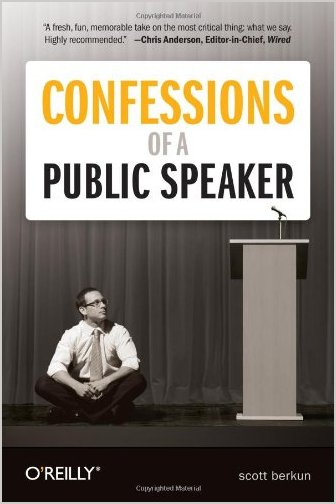 In my last post I reviewed the book 'Confessions of a Public Speaker'. In this book, the author Scott Berkun has talked mostly about how to deliver a presentation well. In this post I share 12 lessons from his book which will help you deliver a presentation or speech better than what you do right now. 1. Do not try to be perfect on stage. You will make mistakes. Accept them, learn from them and move on. 2. No one cares about your mistakes. Audience will not even notice many of your mistakes. So you should stop worrying about your mistakes while presenting. 3. If you are giving a 10 minute talk, prepare for 8 to 9 minutes. You will take more time when you are on stage. 4. Stage fright (fear of public speaking) is natural and every speaker faces it everyday. Use this fear to do well. When you leave a job and start a business, you are scared. You can fail. This fear propels you to do well in your business. Fear is necessary for success. 5. Practice your talk several times before the final speech. Stand up and practice like it is the real thing. Once you become thorough with your content, your stage fright will come down. You will not forget your content on stage. 6. Calm yourself before a presentation. Reach early and make yourself comfortable in the room. Meet the audience members and get to know them. Check your equipments and run through your slides on the projectors. Ensure no technical glitches are there. Reaching a venue late can cause you a lot of tension and stress. 7. Don't go with an assumption that you will get a tough audience. Everyone cannot like you. Some people will always hate you and ask you uncomfortable questions. That's okay. Realise that you also don't like everyone in the world. 8. Everyone pays attention at the start. Use this opportunity. Start well. Share the agenda with the audience and be very enthusiastic. People will decide to listen further only if they like you in the initial moments. 9. Engage the audience. Ask questions, give away prizes. Throw a question/puzzle at the audience. Do not make it a one way traffic where you speak and people listen. Learning happens better by doing, not just by listening. 10. End early. Audience will love you for that. Don't you love when the train/flight reaches early? Don't you love when a meeting ends early and you can reach home early? 11. Be an audience before being a presenter. How it feels to be in an audience? What challenges a speaker faces? Example: Before giving a presentation on video conference attend a similar presentation as an audience. 12. Have a laptop or screen in front of you so you need not look back. Your back should not be facing the audience. The screen can be in the middle of stage (at the ground) facing you. Thanks for the tips. But what about the body language and eye contacts of a presenter. The points you mentioned have been really beneficial and I am in agreement with all the points except the 3rd point. One has to prepare 150% in order to deliver their 100% on stage. Isn't it contradictory ? I was under the impression that for a 10 minutes presentation one should prepare for at least 12 or 13 minutes as people tend forget or increase their speed due to nervousness on stage. So please correct me if I am wrong? As you have said that early end makes the audience feel good, but sometimes it may also have a bad impression that the presenter has not prepared well that's why he has ended it early? Very interesting question Deepak. I have learnt many lessons in the last so many years. One major lesson has been 'to put style before substance'. Earlier I used to worry a lot about slides and templates. Later I understood, the audience wants only content. Slides can be average looking but the content cannot be average. It's the stuff you speak that matters the most. So spend most of your time preparing what to say. Your point is valid. This post is by no means exhaustive. It does contains everything that one needs to do. There are many more things not included here. 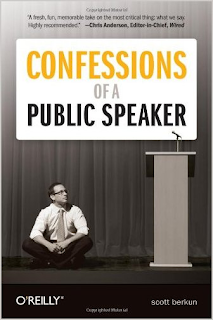 This post only captures the 12 most important lessons I drew from the book 'Confessions of a Public Speaker'. Thanks for the question. I did not mean you have to under-prepare. I completely agree with you that one should give his/her 150%. The 3rd point states that if you have a 10 minute presentation, try to have content which ends by 9 minutes. On stage, there can be disturbances which can delay you. If you get delayed, you will overshoot your alloted time. Hence prepare for 9 minutes and you will not overshoot. Thanks for your questions Imran. You cannot go fast when you actually deliver the presentation. You should not be forgetting your content. That is why the you need to practice. If you practice a talk 5 or 10 times, you will not have such issues. Even if you forget 1 or 2 points, its ok. Just ensure you remember the key points. Interesting point there. We need to understand how much early are you going to end. The audience has been told that you will talk for 30 minutes. This 30 minutes is what you have decided. Now if you end after 25 minutes there is no harm. If you have spoken well, audience will love you for that. The concern that 'what will my audience think' comes from the insecurity we have. We are always worried about being judged by people. Trust me, the audience will love if you end minutes early. Just ensure you don't end at 30 minutes when you planned to speak for 1 hour. That would be too early. Thanks a lot for the reply it will surely help me in improving my prrsentation. Points 3 & 10 were absolutely new to me. Thanks. But I have a doubt regarding point 4 that can’t the stage fright be overcome by using positive auto suggestion rather than accepting the fear is within us? Looking forward to hearing from you..
You have various ways to achieve the same goal. Do what suits you. This book just shares one path. Accept that everyone is afraid. This will cause you to fear less. Some fear is good as it makes you serious and committed. If positive autosuggestion works for you, that's great. You must customise every 'tip' that you read. One tip cannot work the same way for all. it is very informative for me. could u please elaborate ur 1oth point "End Early".is it related with the statement like " one needs to finish his presentation before the audience stop listening it"
thanks vivek for providing us such useful presentation tips. could u please elaborate the 10th point " end early". is it related the statement like " one should finish his presentation before the audience stop listening". 'End early' simply means finish before the alloted time. For example, You have been alloted 30 minutes and your audience is aware of this. Plan for a 25 minute presentation. End before the given time. never exceed your time. This is the spirit of this point. Your question is the same as Vikky's. Already answered. What about the movements of the speaker? is it suggested to utilize the stage while presenting? we have often seen in corporate presentations that the speaker used to move around the stage, for example the launch of macbook air and iphone.we all know how effective Steve Job was in launching these products and he was constantly moving from one side to the other while presenting. What is your take on this? Definitely. I personally advocate moving around. Personally I am very comfortable when I move around (with a wireless presenter in hand). Whether to move or not is a personal choice. It is better if you move, since you can convey emotion and passion better. You can emphasize better through gestures. It will also take you closer to the audience. You will be able to make eye contact easier. Steve Jobs did use this technique very well. I've read your posts of this month. Thanks for presenting (in written) the points distinctly. On a different note, do you guide people with the do-to list for an impromptu speech? Even the experienced public speakers go nervous during the first few minutes, though they have enough knowledge about the topic!! How to overcome this? http://www.youtube.com/watch?v=0g_GQlLRoMs&feature=g-upl This may help your article!! I have guided people in the past on how to present. If someone approaches me, I will definitely try to be of help. 1. Practice your speech/presentation so many times that you cannot forget it at all. Knowing your content gives a tremendous boost. 2. Present whenever you get a chance. Practice makes perfect. Never shy away from presenting to an audience. You are correct. Understanding the audience is the basic step. This is not true. A teacher does this all the time. You teach what people don't know. Why is the teacher successful? Because, he is teaching something important. So, if your content is important to the audience and useful to them, they will like it, even if they did not know anything about the topic before your presentation. What matters is this: Is your presentation useful and simple to understand. I wanted to share one more tip which is "try to divert your concentration from your speech before your turn comes" because it will reduce your fright and it will also relax your mind from all other pressure. Divert your concentration by talking to strangers, chit chat with your friends or whatever which helps you. End Early: It is one of the best thing because as it said here it will make the people love u and also it will impress the judges if there is any because you can able to convey your things effectively within a short period of time and it will show the ability of managing your time efficiently. And also remember this will impress others only when your speech is most effective and with a bit of entertainment.